During the corset platysmaplasty procedure, Dr. Moelleken will make a small, horizontal incision, (discreetly concealed beneath the chin) through which he will join the two sides of the platysma muscle together to create a single muscular sheet that is resistant to the formation of neck bands and enhances the definition of the jawline and neck. Dr. Moelleken will surgically excise the fat from the neck musculature using direct visualization, a technique that allows for the removal of larger amounts of fat than could be eliminated through liposuction alone. He will then perform central plication of the platysma, which involves tightening the weakened or stretched platysma with multiple rows of surgical stitches. This highly effective tightening technique is similar to that of lacing up a woman’s corset, and helps to create a taut, smooth muscle layer and a sharp transition between the neck and jaw, which translates to an improved neck angle and a more youthfully defined neck and jawline. 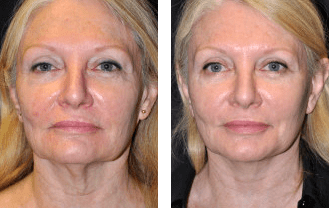 Although a complex and time consuming procedure, patients will benefit from the beautifully natural, long-term results produced by the corset platysmaplasty neck lift. As a result of the unique technical elements required for this neck lift technique, patients may initially experience a tight feeling in their neck after surgery—this sensation is completely normal and will gradually subside. 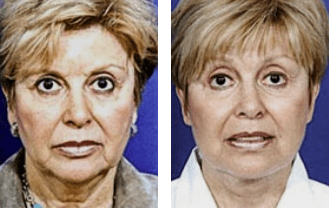 Recovery from a corset platysmaplasty neck lift is relatively simple, necessitating only a few days of downtime (providing that no other procedures have been performed simultaneously). After surgery, patients can expect to experience some degree of bruising and swelling around the jaw, ears, and neck; however, any post-operative bruising should subside within a day or two of the procedure. The results of your corset platysmaplasty neck lift will be visible immediately after surgery, and will continue to improve over the next 1-3 months. Patients considering corset platysmaplasty may also be good candidates for Dr. Moelleken’s signature Necklace® Neck Lift, a surgical procedure that offers many of the same benefits as the corset platysmaplasty, but provides superior improvement of the neck angle and optimal correction of vertical neck banding. At Moelleken Plastic Surgery, our patient-centric philosophy ensures that you will receive the highest quality of care throughout your aesthetic enhancement experience. We take pride in providing our patients with safe and effective cosmetic surgery procedures, and beautifully natural-looking results. Our skillful staff understands how precious your time is, and will take care to ensure that your surgery fits conveniently into your busy schedule. You will never feel rushed while in our care, as Dr. Moelleken will take the time to provide a comprehensive overview of your corset platysmaplasty neck lift options and procedural details. If you are interested in enhancing the appearance of your neck and jawline with a corset platysmaplasty neck lift, please contact Moelleken Plastic Surgery today. We look forward to speaking with you, and to scheduling your initial consultation with Dr. Moelleken.